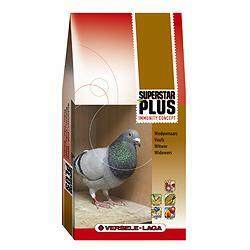 Complete food for pigeons enriched with the special Immunity Concept racing pellet. Superstar Plus I.C. is a widower mixture made with small French Cribs maize. The racing pellet ensures the ideal fat content. Can be combined with Gerry Plus I.C.